The 7th annual Lake Spivey Road Race is finally over. I decided to run this race for the first time early last year. The 15K course is on many of the same roads that I train on almost every day so I figured I'd give it a shot. The fact that I could sleep-in and still make it to the race start in plenty of time was also a deciding factor. 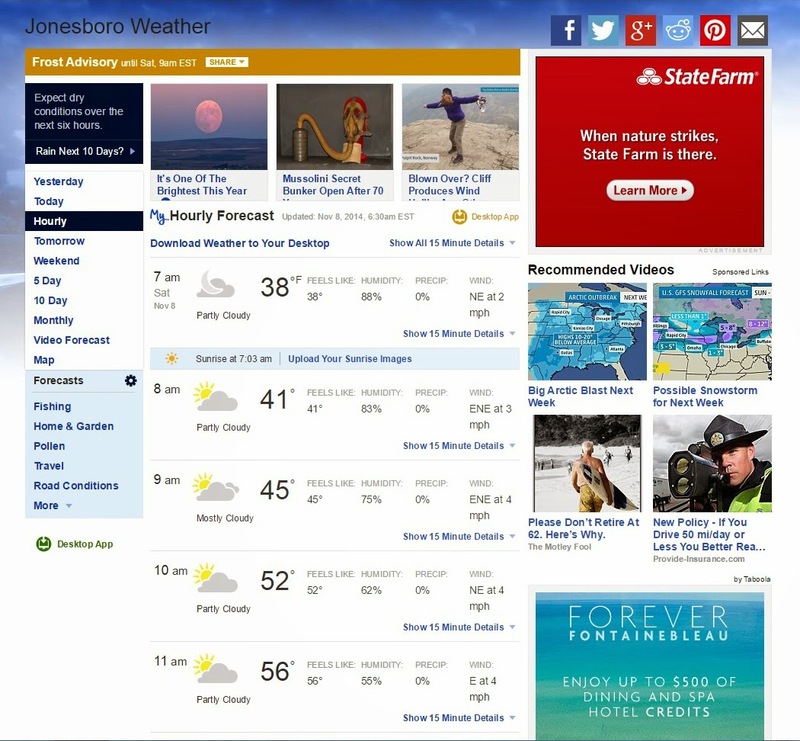 I woke up on Saturday morning at 6:20 a.m., checked the weather. It was cold and clear as was forecast. I got my standing around clothes and gear ready to go. I'd set out most of what I thought I'd need the night before. I was out the door at 7:20 a.m. The race was scheduled to start at 8:00 a.m. The Clayton County Int'l Park entrance was only a few minutes drive from my house. I checked in at the registration table and then meandered around the pavilion a bit looking for someone to pace me. I was checking the competition. The field of runners was small but there were a few runners that looked pretty fast. The race started as scheduled at 8 a.m. with the 5Kers going first. In previous years the 5Kers and 15Kers started together. 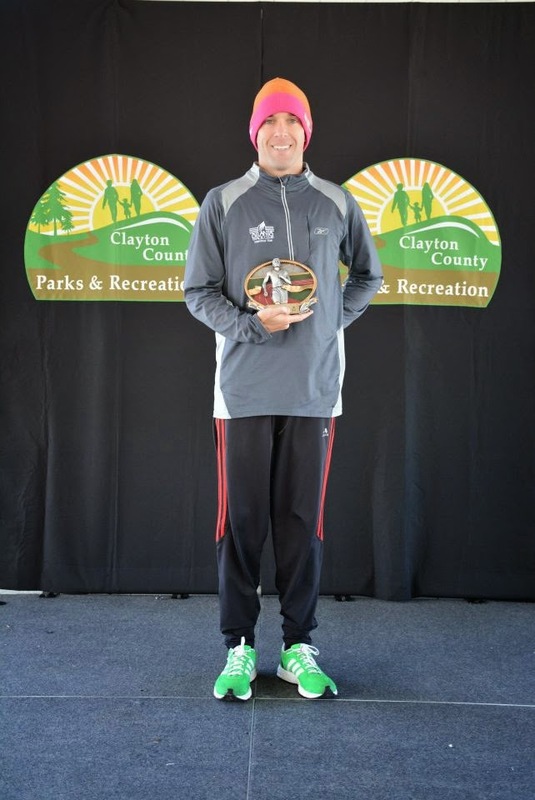 This year the Clayton County Parks and Rec. Department, who organizes the race, did things a little differently. The 15Kers waited as the 5K walkers creeped eastward on Walt Stephens Road. As the 15Kers prepared to start the 5Kers were strung out on the course in a few minutes and soon the 15Kers were off and running. The weather before the race was perfect. It felt cold but it was nothing that a few sprints in the parking lot before the race wouldn't cure. The 15K course was a bit long, 9.43 miles on my Garmin, as the starting mat was located at the finish and not on the actual starting line some 100' away. That was not a big deal though, everybody has to run the same course, short or long. The mile markers were a bit off as well. They weren't off by much but my Garmin and the markers never did jive. Also, no big deal. Water stations were located throughout the course. I didn't use them but it was nice that they were there. There was also a port-o-let between mile 5 and mile 6 should the need arise. It did not, but it could have, and if it did they had it covered. The overall results listed on Orion Racing's website for the 15K show me as finishing 5th Overall and 1st in my odd age-group - 53 to 59. 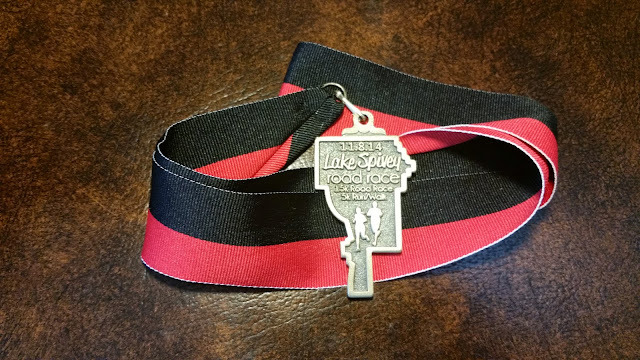 In addition to finishing first I also finished last in my age-group. First and Last! 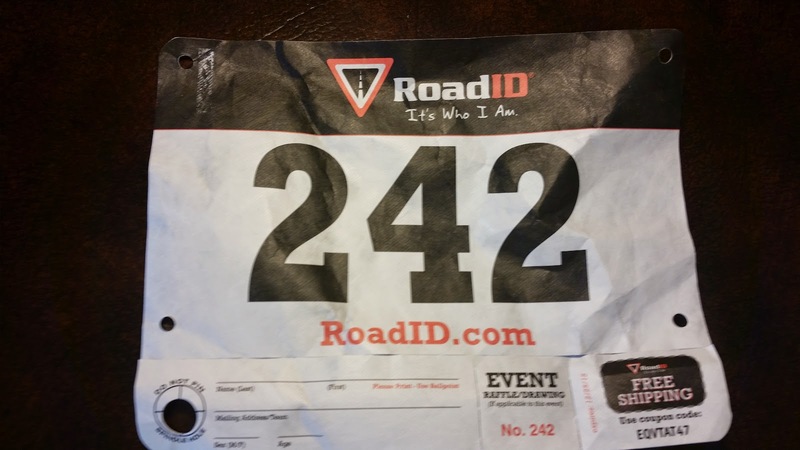 Of the 59 runners and walkers participating in the 15K race I was the only participant in my age-group. Let me take a second to elaborate on the age-groups for this race. 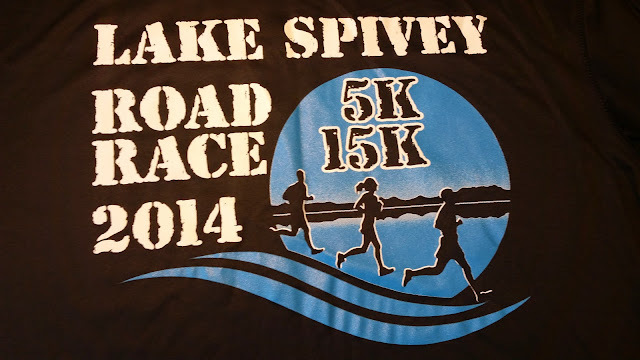 Unlike most races where the age-group rankings are in 5 year increments, the age-groups for the Lake Spivey 15K race were (increment in years) from: 0 to 14 (14 years), 15 to 21 (7 years), 22 to 27 (6 years), 28 to 35 (8 years), 36 to 40 (5 years), 41 to 46 (6 years), 47 to 52 (6 years), 53 to 59 (7 years), and 60 to 65 (6 years). The county took a picture of me (center) with 4th place finisher Weldegebriel (Gabriel) Pietros (l), and overall winner Jon Hager (r). 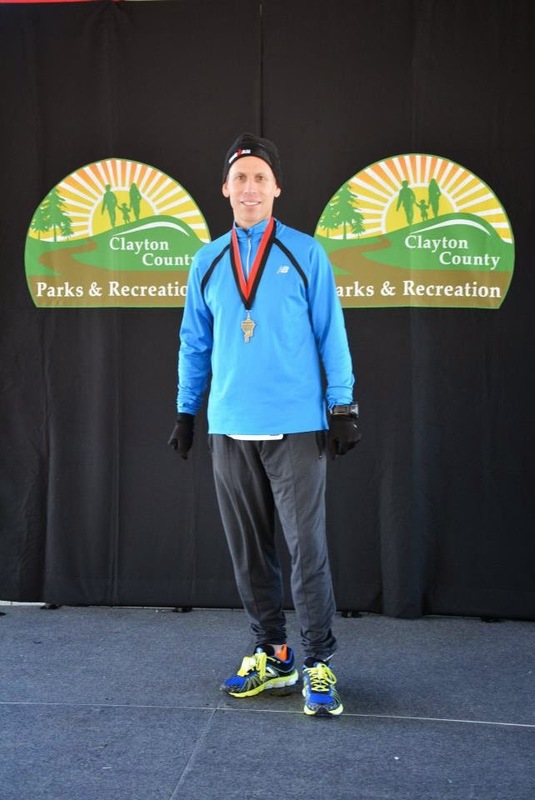 It was nice that the county took a lot of pictures and posted all 343 of them on the Clayton County Parks and Rec. Dept. Facebook page for free download. Jon finished the 15K course in a record 52:48 beating the previous course record of 53:59 set in 2010. I received my medal. They should have given me the silver and bronze as well. 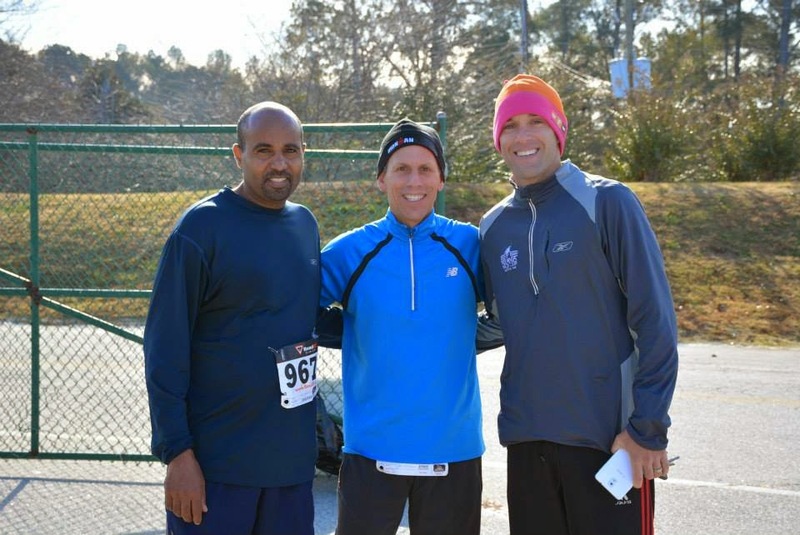 I finished the race in 1:08:29 with a 7:21 min./mile pace. I was hoping for a 7 min./mile pace but...maybe next year!